One of my constant works-in-progress is connecting with my girls when they get home from school. My friend Ralphie uses the term “crossroads” to describe those times of the day when you’re coming or going, and I want to make sure that I’m there for my girls at those daily crossroads. 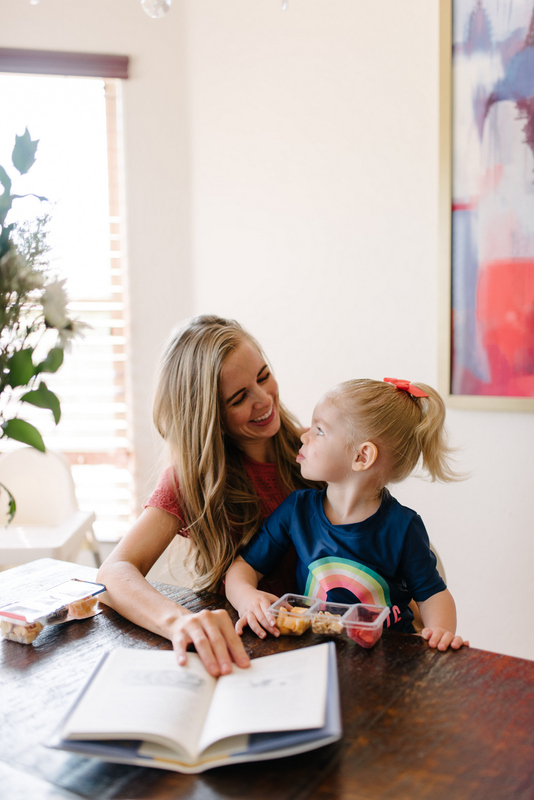 But I pick up my girls from school straight off of quiet time/nap time, which is when I do much of my work and it’s often very difficult for me to switch gears and stop thinking about deadlines, emails, and blog posts and transition back into mom mode. When we get home from school and they’re taking off their shoes and putting away their backpacks, it’s incredibly tempting for me to sneak into my office to do just one more thing (or ten more things) and suddenly the afternoon has slipped away and I don’t feel like we’ve spent any good time together. 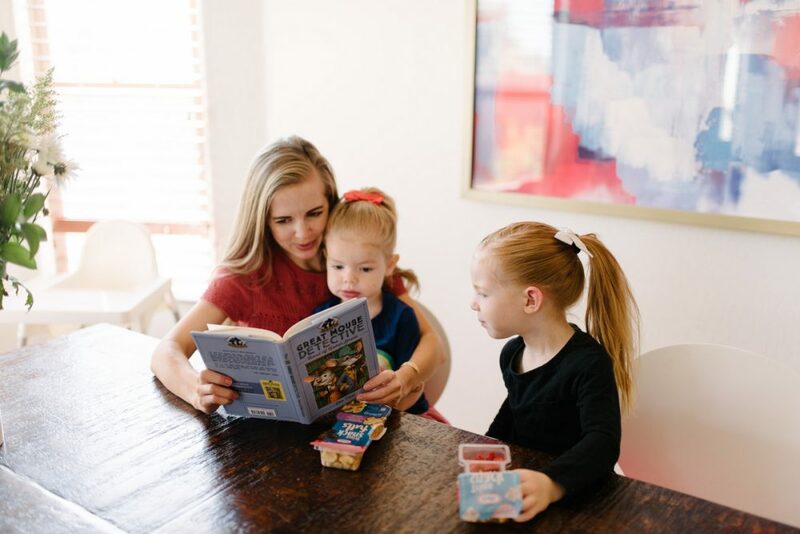 A long time ago, I noticed that if I read first thing after my girls were in bed, it was very easy for me to fit in an additional 10-30 minutes of reading a day, whereas if I went to my laptop first or looked at my phone, suddenly my whole evening got sucked away and all my good intentions were for nothing. Because that’s been so effective for me, I decided to do the same thing with the girls over the past few weeks. Instead of everyone drifting around the house when we get home, I try to read aloud to the girls right when we get home. 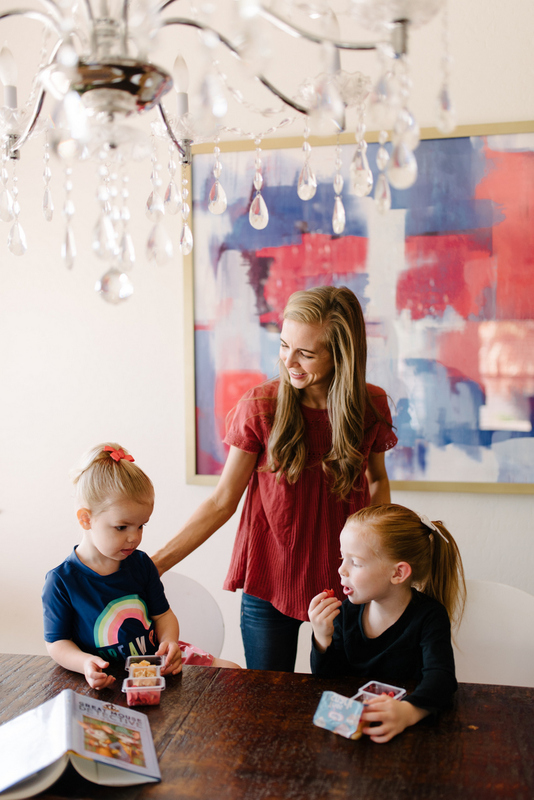 It coincides perfectly with snack time so it’s a lot easier to get them to cooperate with the plan. Sometimes it gets very tricky to fit it in after dinner and before bedtime, so this is a chance to make sure I get to read with them, and they love having that focused time together after a day of school. I also tell myself that it doesn’t have to be hours and hours – it can just be 15-20 minutes together and then if they want to go play dress-up together or water their plants in the backyard or have friends over, there is plenty of time for me to get other things done. It’s also the perfect time for them to eat snack while I read to them so that I make sure everyone gets a snack to tide them over to dinner (I can’t tell you how many times no one has a snack when they get home and then around 4:50, they’re all starving, but now it’s too close to dinner and it’s just a disaster). 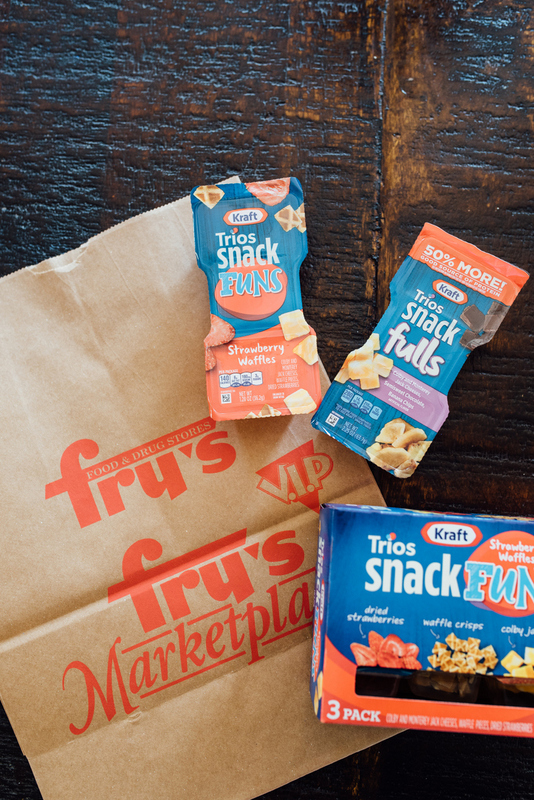 A few weeks ago, I picked up the new Trios SnackFuns (for the girls) and SnackFulls (for me and Bart!) from Kraft in the Fry’s (my local Kroger store) refrigerated section, near the lunch meats – they come in a pack of three and each one contains freeze-dried strawberries, tiny waffle crackers, and cheese cubes (or more adult-friendly choices in the SnackFulls varieties). 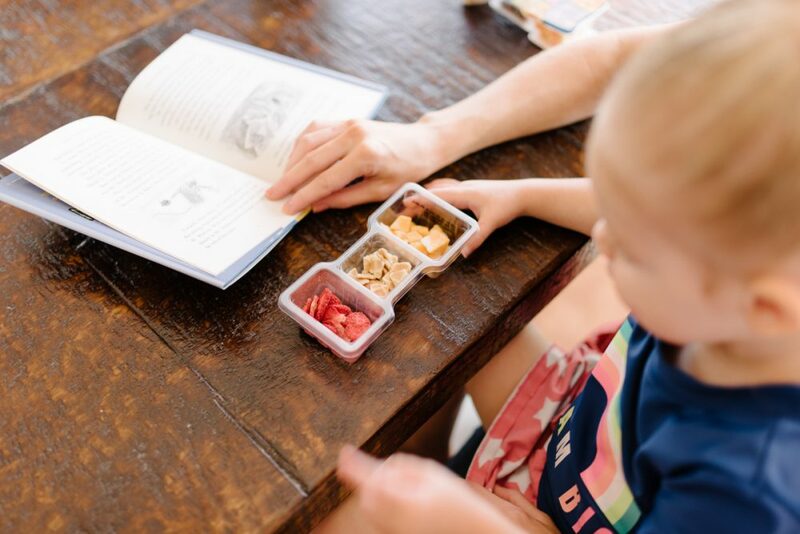 Both SnackFuns and SnackFulls have different flavor options keeping both me and the kids surprised and delighted everytime. And another win for me? THIS coupon saving me some extra $$$ at Fry’s! 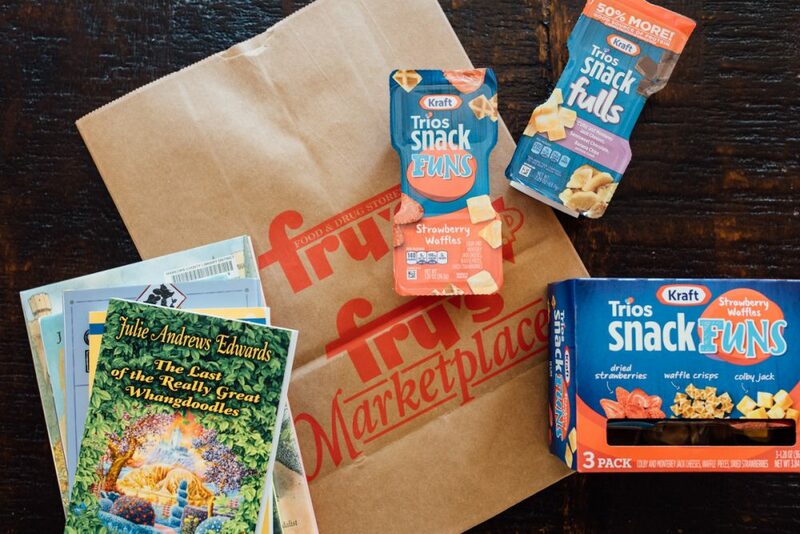 I always struggle with figuring out snacks and the Trios SnackFuns SnackFulls are such an easy solution with a variety of items that all my girls like. They’re also super easy to take on the go, which has been really fun on days when I pick the girls up from school and we go straight to the park to enjoy the last of the cool weather before summer hits and the parks are off-limits for six months. 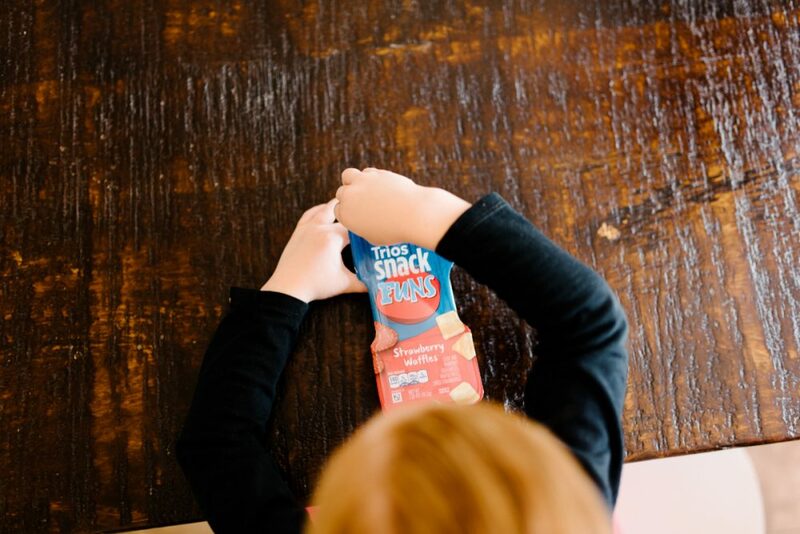 Kraft also has Kraft Trios SnackFulls with chocolate chunks, dried fruit (I’m especially partial to the dried cherries) and cheese cubes is the option I’ve been enjoying alongside my girls. Basically three of my favorite food items in one easy package. Of course, the most important part is having a great book to read aloud that makes it fun for everyone to come home to. The Last of the Really Great Whangdoodles by Julie Andrews Edwards. Ella read this book recently and LOVED it, and I remember being equally delighted by this whimsical magical story by the star of Mary Poppins and The Sound of Music when I was a child. I mean, a secret way to visit a land ruled by one last magical creature and his mythical friends? Sign me up. Basil of Baker Street: The Great Mouse Detective by Eve Titus. It’s hard to go wrong with a children’s novel starring a mouse who lives in Sherlock Holmes’ cellar and solves mysteries. It’s not very long and has lots of illustrations, so it’s a good introductory chapter book for younger readers. Pippi Longstocking by Astrid Lindgren. I’ve never met a child who didn’t just die laughing over Pippi’s hijinks. We’ve listened to this book in the car MANY times and my girls never get tired of it. Princess Cora and the Crocodile by Laura Amy Schlitz, illustrated by Brian Floca. This is another great book that’s not terribly long (80 pages total) and has full-color illustrations. When Princess Cora asks her fairy godmother for help, she’s expecting a way out of her boring lessons and helicopter parents. What she doesn’t expect is a badly-behaved crocodile to show up. Encyclopedia Brown Series by Donald J. Sobol. This series was a favorite of mine growing up and my puzzle-loving girls love it now too. 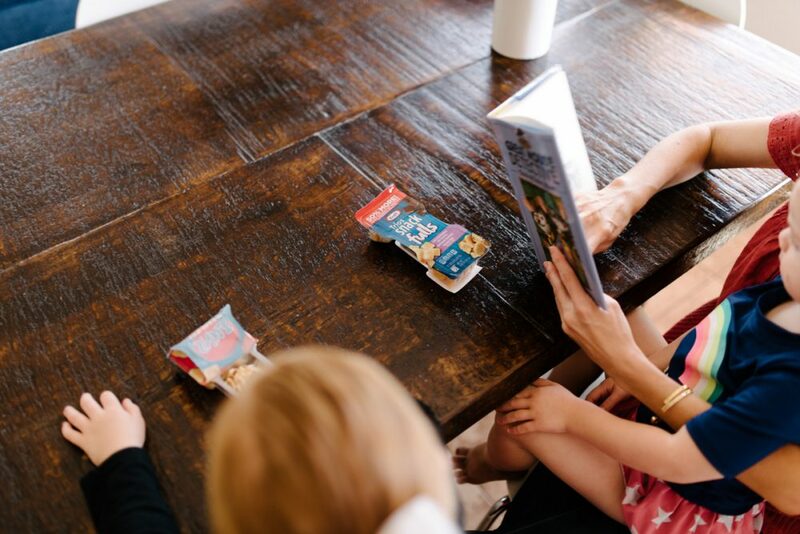 Each episode is perfect for a quick snack-time read and fun to work together to figure out how Encyclopedia solved the case. It makes such a big difference to spend even that brief amount of time together in the afternoon, and helps me feel like I’m being the mom I want to be. And a good snack certainly doesn’t hurt either. Those snacks look yummy. I’m going to keep my eye out for them at the store. The Last of the Really Great Whangdoodles (insert crying face here) is seriously the BEST EVER. and i’ve read a lot of books.